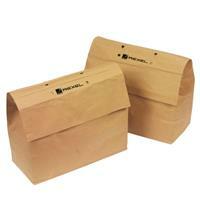 This pack of 20 waste sacks from Rexel were designed specifically to aid in the recycling of shredded paper. The sacks themselves are recyclable so there is no need to have to empty out the contents once full – simply recycle the whole thing. These bags are self-seal, have a 23 litre capacity and are compatible with the Rexel Mercury REM723, RES1223, RES1523, REX1023, REX1323 and other select Rexel Mercury shredders with a 23 litre bin size.